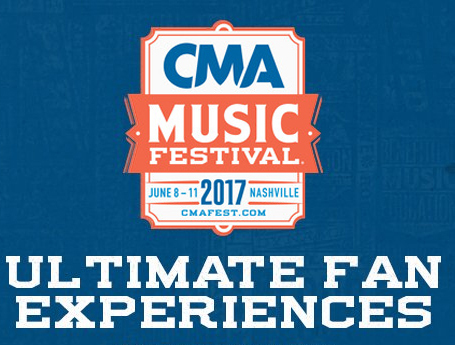 CMA Revamps Ultimate Fan Experiences Drawing for 2017! The CMA has retooled the Ultimate Fan Experiences Drawing and prize redemption procedures for 2017. Participants will have just three days to enter the contest and choices will be locked in upon submission. Previously, entrants had a week to enter and selections were editable until the last day. The entry period for this year's contest to win select meet & greets at Fan Fair X or admission to HGTV Lodge performances begins Tuesday, May 30 at 10 AM CT and closes on Thursday, June 1 at 10 AM CT. Winners will be notified beginning on Friday, June 2 at 10 AM CT and need to claim prizes via the CMA Music Festival App or website by Tuesday, June 6 at 12 PM CT. Unclaimed prizes will be redistributed. Each winner will be allowed one guest. Also new this year is expanded use of "Fan Access" QR codes. Each entrant must register for "Fan Access" and will receive a unique QR code. Winners must report to the prize location one hour prior to its start time and will need to scan their QR code for admission. There will not be any paper tickets or wristbands. "Fan Access" QR codes can be linked to the 4-day stadium pass which will enable 4-day pass holders to scan their passes rather than their smart phones. The QR codes may also be scanned at various locations throughout the festival for chances to win additional prizes. TIP: Print a hard copy of your QR Code if you do not have a smart phone, or 4-day Stadium Pass, or as a backup in case of smart phone failure (dead battery, loss, weak signal, etc). Taking a screen snap of your QR code on your smart phone is also recommended in case of weak cellular service signal.